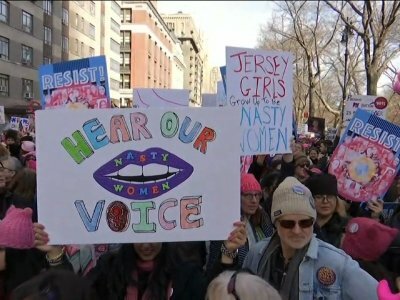 On Saturday, many not only supported women’s rights, but also denounced President Donald Trump’s views on immigration, abortion, LGBT rights and women’s rights on the anniversary of his inauguration. The 2017 rally in Washington, D.C., and hundreds of similar marches, created solidarity for those opposing Trump’s views, words and actions. Millions of people around the world marched during last year’s rallies. Participants on Saturday talked about the news avalanche of politics and gender issues in the past year. They said they were galvanized by the #MeToo movement, which has been credited as countering widespread sexual abuse and misconduct. Critics of the weekend’s marches said the demonstrations were really a protest against Trump. Meanwhile, Trump on Saturday tweeted that it was a “perfect day” for women to march to celebrate the “economic success and wealth creation” that’s happened during his first year in office. Demonstrators on Saturday denounced Trump’s views with colorful signs and even saltier language. In Palm Beach, Florida, home to Trump’s Mar-a-Lago estate, several hundred people gathered carrying anti-Trump signs before marching. A group of women wearing red cloaks and white hats like the characters in the book and TV show “The Handmaid’s Tale” marched in formation, their heads bowed. In Los Angeles, Eva Longoria, Natalie Portman, Viola Davis, Alfre Woodard, Scarlett Johansson, Constance Wu, Adam Scott and Rob Reiner were among the celebrities who addressed a crowd of hundreds of thousands of demonstrators at a women’s march. Portman, an Academy Award winner, talked about feeling sexualized by the entertainment industry from the time her first film, “Leon: The Professional,” was released when she was 13 and suggested it’s time for “a revolution of desire.” In the 1994 film, Portman played a young girl taken in by a hit man after her family is killed. Woodard urged everyone to register and vote, saying, “the 2018 midterms start now,” echoing many speakers at marches across the country, who urged women to vote. Cohen reported from Los Angeles, and Dobnik reported from New York.